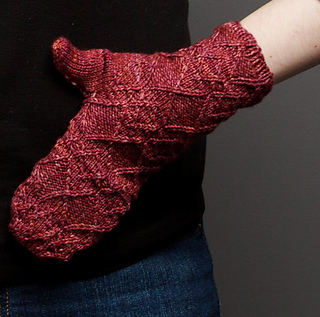 As in the story, these mitts can take on whatever character suits your desires. Worked from the cuff towards the fingers, this pattern can be used to make wrist-warming cuffs, fingerless mitts, or full mittens. Everything listed above, plus pattern expanded pattern includes two more sizes: XS and 2X. In the normal Fiber Dreams format. Single pattern PDF is 4 pages, and includes just the one pattern. PDF has been tech-edited, again, to ensure the new sizes work. Errata is only for my self-published version of this pattern.